In 2010, founder Jason Knott was leaving a bar after having a few drinks with some friends. Upon leaving the bar, he was immediately pulled over by a cop waiting in a near-by parking lot. Jason performed the field sobriety tests and passed them all fine, however when it came time to blow into the portable breathalyzer he blew .081; just barely over the legal limit! Luckily for Jason, the cop told him to park his car at a local gas station and get a cab. Jason later stated "If I knew I was over the legal limit, I wouldn't have driven." In an effort to help educate the public, he created BreathAdvisor, a company that would provide patrons an accurate reading of their blood alcohol content at the point of consumption and also the ability to get a safe ride home. Of course the best idea is to never drive if you've had anything to drink, but unfortunately this just isn't the case for many people. BreathAdvisor provides just one more option that could help prevent someone from making the mistake that could not only cost them on average $10,000 in fines and fees, but also their lives and the lives of others. Our mission is to provide patrons with an accurate reading of their BAC (Blood Alcohol Content) and if needed, provide them with a safe option to get home. By doing so, we will contribute to decreasing the amount of DUI related fatalities and protect patrons from the detrimental effects of receiving a DUI conviction. 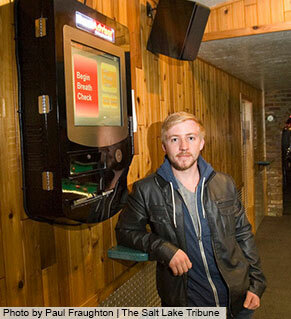 Read about our technology and learn how we are setting the breathalyzer kiosk standard.